Make this Father’s Day all about the man of the house with a super special dash for the most daring of Dad’s. 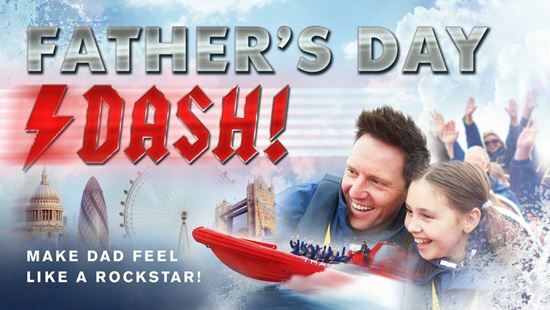 Forget your classic car shows and steak dinners, give Dad something to really get his teeth into with a Thames Rockets speedboat ride that will blow everything else out of the water! For the rockers and the rollers, the DIY wonders and the petrol heads alike, our Father’s Day Dash delivers the perfect adrenaline fuelled fun that will have Dad feeling like a kid all over again. From our world famous London Eye departure point, take to the water for a blast just for the boys. Don’t worry ladies - our quick witted guides are on hand to ensure Dad doesn’t have all the answers, showing you the spectacular sights of London along the greatest Dad of them all – Old Father Thames. Once Dad has shown off his knowledge it’s time to crank up the heat and send him flying into boy-heaven! With the equivalent of two cars propelling him through Canary Wharf this is extreme Formula One on the water! Twist and turn, rock and roll and bounce across the wake enjoying everything that has made Thames Rockets the #1 speedboat operator in the UK – why settle for anything less? With music especially aimed for everyone from the old rockers to the new romantics, we’ll guarantee Dad will be trying to remember the words all along the river on the ride of his life. It’s the #1 speedboats for the #1 Dad’s this Father’s Day. *Father's Day Dash experiences are available on Sunday 16th June 2019 departing from the London Eye Pier. "A Father's Day to remember"
Today I took my dad to the Thames rockets speedboat experience for Father's Day and it was amazing! Little Mike and Ginger Mike were incredible tour guides as well as making sure we all had the best time possible on the boat. Thank you so much, will be telling everyone to book up with you! !